Laminated paper bags are made from high quality coated paper such as art paper or card paper,laminated with matt or glossy opp film,fitted with rope handle,ribbon handle or die cut handle,and reinforced paper board at top and bottom of bag,. Laminated paper bags at Gift Box Shop are hand made to ensure high quality and available in any size,color and shape to fit any requirement in need of high quality paper shopping bags to add more value to business goods and service. 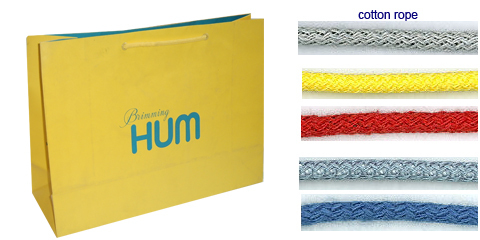 Laminated paper bags are perfect for high fashion boutique,exhibitions,event conference,products launches. How to select right laminated paper bags for business, choose from below items to create right own laminated paper bags within budget. Made of coated paper,with glossy or matt lamination,huge selections of handles.We can print any color on laminate paper bags,cheap price,short run is available. Gift Boxes Shop have good experience to print any color on coated paper then build laminated paper bags, luxury paper bags and euro tote paper bags,no limit of printing area and run quantity. Hot Stamping,Embossing,UV spot varnish are great methods to print and highlight custom logo,accent pattern,impress customer and exposure brand.Gift Boxes Shop specialize in manufacturing laminated paper bags with hot stamping,laminated paper bags with embossing, laminated paper bags with spot uv varnish,that can meet your demand at high end quality laminated paper bags to promote your business.You can choose from below items to create your laminated paper bags with hot stamping,embossing,uv spot varnish. Laminated paper bags are made of high quality coated paper--art paper & card paper whose grammage range from 120g to 250g to fit different size and products. Laminated paper bags are laminated with matt or glossy opp film to protect paper and printing and add more class and elegant touch. Laminated paper bags are available in any color,in fact coated paper have the best effect of printing,any fine art work and design can be printed on coated paper perfectly then fold into bags.With printed business brand and image,Laminated paper bags become good promotional tool to enhance business awareness. There are huge handle selection for laminated paper bags,options include pp handle,cotton handle,die cut handle,ribbon handle, and more,those handle can be colored to match bag's color or business brand color,such as ribbon handle,custom logo can be printed on to get a personalized handle to highligh business brands. There are many finishes process to highlight business brands on Laminated paper bags ,finishes process options include hot stamping,embossing,uv spot varnish and more. Laminated paper bags are available in any size and shape to fit any occasion and end. Gift Box Shop create high quality laminated paper bags using super fine material for each and every customers,With custom logo printing,customized paper bags add style to a customer's purchase and leave a lasting impression,those printed paper bags are an opportunity to cement your brand identity as an important part of branding and marketing.Select from numerous styles and finishes,laminated paper bags at Gift Box Shop are designed to promote your products and enhance your business. Laminated paper bags are made from high quality coated paper which have the perfect printing effect,after printed custom logo or image on sheet,it is hand made to glue paper to fold into bag that can ensure every laminated paper bags high quality to present the business the best. Laminated paper bags are available in any size,shape to fit customer's specification, fitted with different handle to provide comfortable conveying feeling as well as get eye-catching effect to enhance business brand awareness. In the same time,finishes process used on laminated paper bags have the stunning effect to stand out business brand to get promotional purpose.You need not pay too more to create luxury paper bags that can inspire customer's confidence on your business. Gift Box Shop specialize in manufacturing laminated paper bags,and important there is no minimum run for custom made laminated paper bags,contact with us now to get your laminated paper bags.